Stockton Axson writes about plans to visit Jessie. 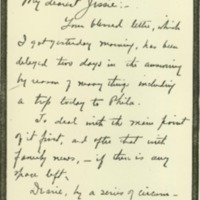 Your blessed letter, which I got yesterday morning, has been delayed two days in the answering by reason of many things including a trip today to Phila.To deal with the main point of it first, and after that with family news,—if there is any space left. Dearie, by a series of circumstances which it would take long to narrate I had to fill in Nov 13 and Nov 16 with lecture engagements, but I do want to come you for November 25–29. And I want to so much that I am going to make this proposition to you: it may be that you have arranged for other guests then, but if you are to be in Williamstown at all I will come anyway and stay at a hotel & see you and Frank just when you are at leisure. Now, you must deal perfectly frankly with me about this—and the frankness is in two terms: first you may be planning not to be in Williamstown at all at that time, for I believe that is Thanksgiving week. Of course, you know that (much as I want to see you) it would grieve me dreadfully to have you alter going-away plans in order to let me come—if you are to be away I will come in December; secondly, if you plan to have other guests, don't hesitate to say so, for such a travelling man as I can be perfectly comfortable in a hotel, and I will still have a chance to see you & Frank, which is the main point. And I do want to see you, dear. If you can reply to this before Saturday please send the answer to Hotel Collingwood, New York City—(W. 35th St)—if not that early, then send to Princeton. News in short hand: I had to miss Brother Woodrow's visit to Princeton today because of a lecture engagement in Phila—I voted early, took the train, just back.Ed & Margaret Elliott have been here a week & went to Washington today with your Father—they return to Calif Wednesday. A touch on my shoulder in Chestnut St today, turned to see Mrs. Howe, Annie, & Josephine—down to get their stuff out of storage—for N.Y.Saturday was with Nell & Mac in N.Y., Nell looking radiant. Am (just at present) in N.Y. four days each week—lecturing four times—and see “Meemee” and Marjorie Brown—such a joy! Dear and dearest love for both. Axson, Stockton, 1867-1935, “Stockton Axson to Jessie Woodrow Wilson Sayre,” 1914 November 3, WWP17502, Jessie Wilson Sayre Correspondence, Woodrow Wilson Presidential Library & Museum, Staunton, Virginia.